I got to the beach at last this weekend. There was sun, sand, and the perfect family day out (with two kids under ten). I also brought along my nemesis—a skim board that I purchased in a moment of madness. I could surf in my youth, so I figured how hard could it be? Turns out it was very hard—what just call me “Mr. Face Plant.” To make matters more embarrassing, my 9-year-old son had a go, and after a couple of tries, he was successfully riding the board. That got me thinking. Apart from my son’s youth, stamina, flexibility, better balance, and all-around natural ability, what was keeping him up and me flat on my face? Using a bit of drift wood for a pen and the wet sand as paper, I started to think. The skim board works by balancing the rider’s weight over a large area against the water trapped under the board as it moves forward. The skim board doesn’t displace enough water on its own, so it has to generate additional lift by squeezing the water between the board and the sand. In automotive terms, you’re aquaplaning across the water. This additional lift can be calculated by leveraging the work of Sir Isaacs Newton, and taking into account the skim board’s “ground effect.” So with a bit of basic trig and guestimation, I worked out that my skim board would generate about 80 lbs of lift at jogging speeds. This is great for my son, giving him quite a ride before the speed bleeds off and the board settles gently onto the sand. For me to have similar additional lift, I would have to run at 12 miles an hour, which is a) tricky and b) raises the bar in the coordination stakes. But the physics didn’t lie. I would either have to get a board three times as big, or get significantly better. Once I got home I decided that to see if SolidWorks could validate my “sand pit” calculations. 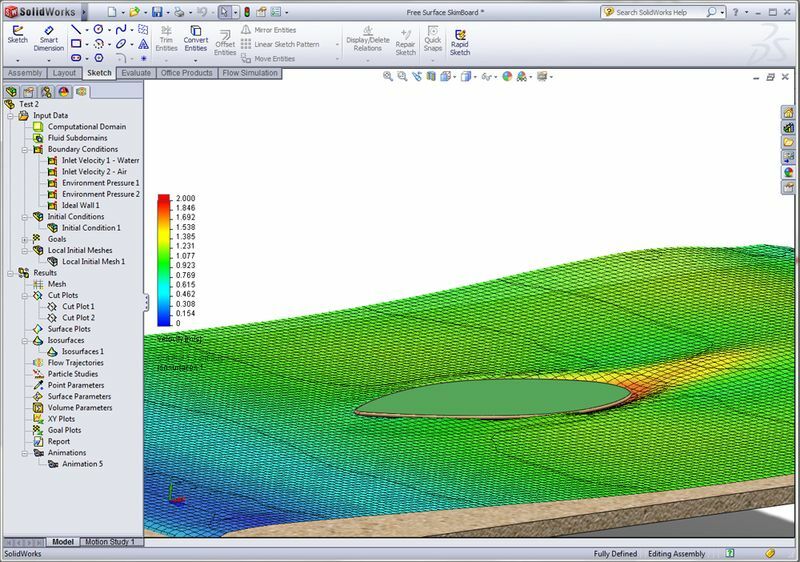 Could I get SolidWorks Flow Simulation to simulate what was going on at the beach? Well, to be honest, not 100%. But maybe close enough for engineering. I was going to have to trick Flow Simulation into solving a problem that the developers say it cannot solve namely that of a partially-submerged body in a flow of water. It’s the partial bit that causes all the problems, and calculating the bow wave and the wake is a big headache. But I had a couple of tricks up my sleeve that allowed me to carry out a comparative analysis, which in a lot of cases is enough to get your job done. Skimboard velocity showing a good wake but an overly large bow wave. After 20 minutes of work I had my first set of results, and after a few modifications, I was quite pleased with the result. If we look at the flow simulation results above, we can see that although I am approximating this problem, I get quite a nice wake being developed. But if we look at the flow simulation results from the side, we can see how the water is squeezed between the beach and the board (generating the lift), but the bow wave is unrealistically large. So although I could fool SolidWorks Flow Simulation into approximating the solution, the fact that the board cannot “float” results in upstream errors. So is there any benefit to carry out approximate simulations like this? Very simply, yes. In many design situations, the trending of the product performance under a consistent load case, but with varying geometry, is incredibly valuable. 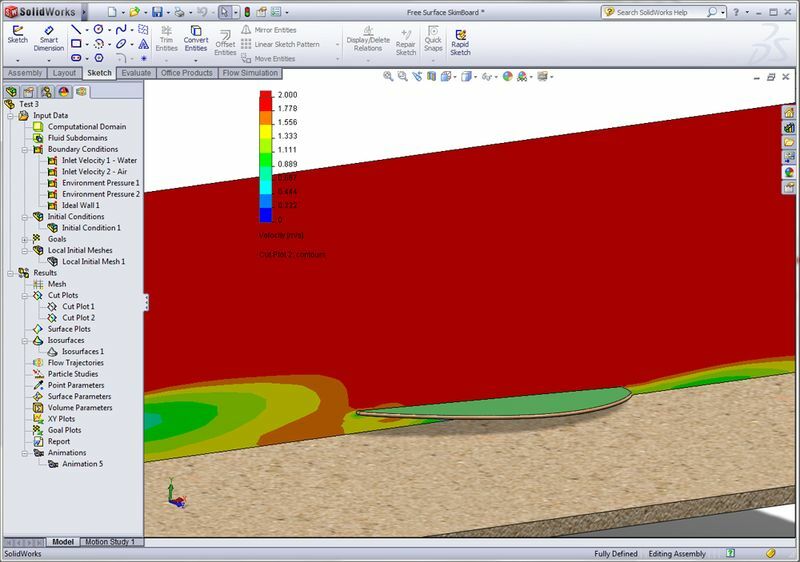 So for our skim board, SolidWorks Flow Simulation tells me the lift and drag generated in this approximate simulation. That means it will tell me if my design gets better or worse when I make design changes! One of the secrets of simulation is that sometimes the global behavior is more useful than the calculated numbers. So if you ever see a sun burnt man doing trig in the sand on the beaches around Boston, stop by, say hello, and check my math.